We’d love your help. Let us know what’s wrong with this preview of 13 Treasures by Michelle Harrison. Th No one else can see the evil fairies that rouse Tanya from her sleep, torturing her at the slightest mention of their existence, but they are as real to the 13-year-old as anything she's ever known. She cannot rid herself of them, nor can she ignore them. But it is her insistence on responding to them that has her banished to her grandmother's secluded countryside manor. To ask other readers questions about 13 Treasures, please sign up. Why doesn't Tanya stop writing them in her diaries or inform anyone so the fairies stop tormenting her? Alexa Richards She does not stop because she wants the world to know that shes not crazy and that she can actually see them. Why does she cry when the drain-dweller die? I thought she was pestered by them????? L. B. Bugle I think it's because she doesn't want other fairies to punish her for a fey creature dying under her watch. Tanya is an average twelve year old with one exception - she's got the second sight. This means she can see faeries, usually ugly, squat creatures that torment her with mischievous acts. After another Tanya versus faeries incident goes awry, her mother (having had enough) sends Tanya to stay with her cold grandmother at Elvesden Manor. This debut effort won the UK's Waterstone's Prize and is a great little read. The plot was a little uneven at times but the adventures of Tanya and Fabian in inves Tanya is an average twelve year old with one exception - she's got the second sight. This means she can see faeries, usually ugly, squat creatures that torment her with mischievous acts. After another Tanya versus faeries incident goes awry, her mother (having had enough) sends Tanya to stay with her cold grandmother at Elvesden Manor. This debut effort won the UK's Waterstone's Prize and is a great little read. The plot was a little uneven at times but the adventures of Tanya and Fabian in investigating the disappearance of Morwenna Bloom was vastly entertaining. There is a mystery that involves both of their families, a boatload of magic and a lot of intrigue. While the narrative is nicely wrapped up and can be considered self-contained, there is definitely a lot of room to pursue a series here. I really enjoyed the idea that faeries are plentiful in our world and usually with evil motivations and a lot of hate. These faeries are a far cry from Tinkerbell, clapping in this book will only serve to incite a biting incident. Tanya is very isolated from humans in this novel. Her mother dumps her with her old, frosty grandmother, cantankerous groundskeeper and his precocious and supremely annoying son, Fabian. Yet Tanya's whole world is tolerating and surviving the ever presence of faeries that refuse to leave her alone. The story is grim and grotty - the odours and grot that permeate this book are always felt by the reader. There is a definite atmosphere that has been created with expertise. I really enjoyed this novel, it took awhile to get going but once it did I was captivated. It's a little darker than one might expect but I suspect that's why kids would like it. It doesn't condescend or talk down to the read, instead creates well rounded characters, a vivid setting and an intriguing plot. Perhaps if I had read this when I was actually the target age, I would have liked it better. But I'm not a preteen anymore, and that probably has a great deal to do with why I ended up being less than thrilled with this book. It's shame, because the cover is beautiful, and I liked the idea of a book with malevolent fairies. It isn't a bad book. Harrison does a great job with setting her scenes. I get a definite sense of the place this is set in, and I appreciate that. I also like that she allows Perhaps if I had read this when I was actually the target age, I would have liked it better. But I'm not a preteen anymore, and that probably has a great deal to do with why I ended up being less than thrilled with this book. It's shame, because the cover is beautiful, and I liked the idea of a book with malevolent fairies. It isn't a bad book. Harrison does a great job with setting her scenes. I get a definite sense of the place this is set in, and I appreciate that. I also like that she allows her fairies to be menacing, but not uniformly so. And there's enough variety in the fairies she describes to be interesting. There's also a few wrinkles in the story that I hadn't expected. Where this book fails for me is with the main character, Tanya. I really do think that if I were still twelve, I would like her better. But she's stubborn past the point of reason, and oddly slow on the uptake. She knows that the fairies will torment her if she, in any way, speaks or writes about them. So there's nothing to gain from writing in and burying journals, especially when she has nothing terribly interesting to say. And if she's been tormented by fairies all her life, why in heaven's name has she never researched them? It's not like there's a lack of material for her to read. By luck, I received the elusive 11th copy from Simon & Schuster’s LJ Giveaway and am so very glad I did! I started reading this book in the evening before bed and got halfway through before forcing myself to find a not so scary part to stop on and put it away until the morning. Tanya isn’t your average 13-year-old girl (or is she 12? She’s young, let’s leave it at that): she can see fairies. These aren’t the kind to grant you wishes or help clear up acne. The fairies in Michelle Harrison’s 13 By luck, I received the elusive 11th copy from Simon & Schuster’s LJ Giveaway and am so very glad I did! I started reading this book in the evening before bed and got halfway through before forcing myself to find a not so scary part to stop on and put it away until the morning. Tanya isn’t your average 13-year-old girl (or is she 12? She’s young, let’s leave it at that): she can see fairies. These aren’t the kind to grant you wishes or help clear up acne. The fairies in Michelle Harrison’s 13 Treasures are dark, malevolent, and sometimes hideous creatures with foreboding agendas and secretive movements, determined to keep their existence a secret from bumbling mortals and make life miserable for those, like Tanya, with the Second Sight. The ability to see fairy folk has been a negative experience for Tanya. Part One opens with a group of three fairies, Raven, Gredin, Feathercap, and a squat toadish thing Tanya dubs Mizhog, scolding our protagonist for having written about them in her diary. Despite having buried it, the fairies discovered her mistake and threaten Tanya least she slip again. To insure the lesson’s learned, the fairies wreak havoc in her room and leave before Tanya’s mother is alerted once more to what she believes are her daughter’s tiresome antics. Finally fed up, she sends Tanya and her dog, Oberon (a lovely, slightly plump doberman), away to live with her maternal grandmother for two weeks at Elvesden Manor, an enormous family property well outside London on the outer edges of Hangman’s Wood. Tanya is resigned to her fate: her grandmother seems to find any and all reason to avoid her and when she doesn’t, never fails to act distant and cold; the groundskeeper’s son Fabian is a nosy, bothersome boy around the same age as Tanya. Sure that the next two weeks are going to be a boring, irritating, and insufferable existence Tanya is surprised when she discovers a door downstairs normally kept locked, like most other rooms in the Manor, opened. Peering inside and finding no one to deter her curiosity, Tanya steps inside to discover Florence (her grandmother) has a library. Inside are dozens of books on magic and fairies. Unable to resist, Tanya makes a stack and just as she’s about to leave, flips through a copy of A Midsummer Night’s Dream when a newspaper clipping left inside catches Tanya’s eye: a girl named Morwenna Bloom disappeared in Hangman’s Wood under mysterious circumstances fifty years ago and was never found. Florence startles Tanya out of her musings and before she can get away, is shocked when her grandmother gives her some jewelry that had been stashed in the desk: a silver bracelet with 13 charms dangling off the metal. Taking her unexpected gift and stealing a copy of Myth and Magic Through The Ages, Tanya makes her way back to her room hoping to find in its pages more insights into fairies and why she in particular can see them when it seems no one else can. What follows is the dark adventures of Tanya and Fabian working together to discover the truth behind Morwenna’s disappearance, unlock mysterious doors, travel hidden passageways, all while avoiding the suspicious, watchful eyes of Florence and Fabian’s father and grandfather, Warwick and Amos. Harrison writes a wonderfully scary tale of love, family, and friendship with none of what I would have expected. The protagonist is a strong female figure who relies on her wits and strengths, unafraid to ask for help from those around her and thankfully, does not fall in love with anyone. It was such a relief to read a YA book that didn’t involve a romantic coupling with the female protagonist. Rather, the romance in the book was as dark and menacing as the fairies themselves. I really enjoyed Fabian’s character and hope to see him explored a little more in the sequel, as well as, now that the events of 13 Treasures are wrapped up, Warwick and Florence. The surprise twist ending that revealed the true relationship between Warwick and his employer was perfect! I never would have guessed it on my own. I also am impressed with Harrison’s interpretation of the fey folk and their magical world, even though I’ve heard a lot of it before, but her execution was especially pleasing; their interaction with the mortal world was as seamless and charming (or frightening) as I could have hoped for. There isn’t too much I want to go into because I do feel this is such an amazing find, you really need to go out and read it for yourself. These are not the fairies you’d associate with Disney. These fairies are dangerous, and torturous. They hate th A stunning debut novel that I absolutely devoured. I read this last year and have read it several times since. The writing is top class, beautiful and easy to read, yet at the same time, it doesn’t feel as if the writing has been dumbed down so that younger audiences can keep up. When reading it, there is no doubt as to why it was awarded the Waterstone’s Children’s Book Prize for 2009. Την τελευταία διετία έχω ανακαλύψει πως, αν και δεν θα το φανταζόμουν ποτέ, γοητεύομαι ιδιαίτερα από ιστορίες με νεράιδες, ξωτικά και άλλα παρεμφερής γενετικής, πλάσματα. Οι εκδόσεις Λιβάνη, κατέχουν τα ηνία στην κατηγορία αυτή, με την τριλογία των "Trylle" και την τετραλογία του "Φτερά" να έχουν κερδίσει μεγάλη μερίδα του αναγνωστικού κοινού της χώρας μας. Δύο σειρές που ναι μεν έχουν κοινά στοιχεία, βασίζονται σε έναν παρόμοιο άξονα ωστόσο, τελικά, είναι πολύ διαφορετικές και τις αγαπάμε γι' α Την τελευταία διετία έχω ανακαλύψει πως, αν και δεν θα το φανταζόμουν ποτέ, γοητεύομαι ιδιαίτερα από ιστορίες με νεράιδες, ξωτικά και άλλα παρεμφερής γενετικής, πλάσματα. Οι εκδόσεις Λιβάνη, κατέχουν τα ηνία στην κατηγορία αυτή, με την τριλογία των "Trylle" και την τετραλογία του "Φτερά" να έχουν κερδίσει μεγάλη μερίδα του αναγνωστικού κοινού της χώρας μας. Δύο σειρές που ναι μεν έχουν κοινά στοιχεία, βασίζονται σε έναν παρόμοιο άξονα ωστόσο, τελικά, είναι πολύ διαφορετικές και τις αγαπάμε γι' αυτό. Η σειρά εκείνη την οποία δεν είχα ανακαλύψει, και φέρει επίσης την υπογραφή των εκδόσεων, είναι εκείνη των "13 Θησαυρών" όπου μια πολλή καλή φίλη, με προέτρεψε να την διαβάσω. Και δεν θα το κρύψω, αρχικά, είχα κάποιους ενδοιασμούς γιατί ψάχνοντας πληροφορίες για το βιβλίο διαπίστωσα πως απευθύνεται περισσότερο στη μέση παιδική ηλικία, παρά σε ενήλικους. Παρ' όλα ταύτα, το τόλμησα και ξέρετε κάτι; Δεν μετάνιωσα καθόλου! Η Τάνια είναι ένα δεκατριάχρονο κορίτσι το οποίο, έχει να αντιμετωπίσει περισσότερα προβλήματα σε σχέση με τα παιδιά της ηλικίας της και αυτό οφείλεται στο ότι η Τάνια, είναι διαφορετική. Από τότε που άρχισε να καταλαβαίνει, συνειδητοποίησε πως μπορούσε να δει πράγματα που οι άλλοι αδυνατούσαν. Ξωτικά, νεράιδες, ακόμα και καλικάντζαρους, πλάσματα για τα οποία, δεν επιτρέπεται να μιλήσει σε κανέναν. Όταν η μητέρα της την εξορίζει ουσιαστικά για κάποιο διάστημα στο σπίτι της γιαγιάς της στην εξοχή, θα εκνευριστεί και θα αγανακτήσει, αφού η γιαγιά της δείχνει να τη μισεί και ο γιος του επιστάτη του αρχοντικού, Φαμπιάν, την περιτριγυρίζει συνεχώς, όμως σύντομα, μια μυστηριώδης υπόθεση χρόνων στην οποία ποτέ δεν δόθηκε λύση και απαντήσεις, θα της τραβήξει το ενδιαφέρον. Γιατί στο δάσος που απλώνεται γύρω από το σπίτι της γιαγιάς της, πριν πενήντα χρόνια, μια κοπέλα εξαφανίστηκε χωρίς να αφήσει ίχνη πίσω της και ποτέ κανείς δεν έμαθε τι της συνέβη, παρά που υπήρχαν φήμες πως της έκανε κακό ο παππούς του Φαμπιάν, Έιμος, που ήταν ερωτευμένος μαζί της. Τα δύο παιδιά, αποφασίζουν να ανακαλύψουν την αλήθεια και μπλέκονται σε επικίνδυνες περιπέτειες. Πρώτα απ' όλα πρέπει να ξεκαθαρίσω πως ναι, το συγκεκριμένο βιβλίο, κατ' εξοχήν, απευθύνεται σε παιδιά μέχρι το στάδιο της προεφηβείας τους. Ωστόσο, αυτό δεν σημαίνει κάτι το ιδιαίτερο. Προσωπικά, ως ενήλικη, το διάβασα με μεγάλη ευχαρίστηση και με μιαν ανάσα, χωρίς να σκεφτώ ούτε για μια στιγμή στη διάρκεια της ανάγνωσης πως στα χέρια μου κρατούσα ένα παιδικό βιβλίο. Για μένα, οι ταμπέλες αυτές, χρησιμοποιούνται αποκλειστικά και μόνο για κατηγοριοποιήσεις στα ράφια των βιβλιοπωλείων και η χρησιμότητα ή η αντιπροσωπευτικότητά τους, σταματάει κάπου εκεί. Γιατί αν ένα βιβλίο σε διασκεδάζει, σε ψυχαγωγεί, σε ταξιδεύει και πάνω απ' όλα, σε κάνει να ξεφεύγεις έστω και για λίγες ώρες από την μίζερη πραγματικότητα, τι σημασία έχει σε ποιες, θεωρητικά, ηλικίες απευθύνεται; Άλλωστε, όλοι μας κρύβουμε ένα παιδί μέσα μας αρκεί να υπάρχει η κινητήριος δύναμη που θα το ωθήσει να βγει προς τα έξω και βιβλία όπως αυτό, πετυχαίνουν τον προαναφερόμενο στόχο και με το παραπάνω. Η ιστορία της Harrison είναι ιδιαίτερη και για το είδος της, αρκετά πρωτότυπη θα τολμούσα να πω. Η συγγραφέας, δεν αρκείται στο να χρησιμοποιήσει τα πλάσματα αυτά με την χαριτωμένη και χαρισματική μορφή της. Ορισμένα από αυτά είναι καλά, ως προς τον χαρακτήρα τους κάποια άλλα όμως, είναι ολότελα κακά. Φυσιογνωμικά, δεν είναι όμορφα και χαριτωμένα αλλά έχουν κάθε λογής σχήμα και μορφή καθιστώντας ορισμένα από αυτά γοητευτικά και κάποια άλλα τρομακτικά και αηδιαστικά. Παίζει δηλαδή με τις δύο όψεις του νομίσματος και αυτό, είναι συναρπαστικό. Από 'κει κι έπειτα, δεν μένει μόνο στο παραμύθι και η πρόθεσή της, διόλου ρομαντική δεν είναι. Αντιθέτως, μας προσφέρει μια περιπέτεια μυστηρίου, γεμάτη αγωνία και δράση, πλημμυρισμένη από σκοτεινά μυστικά που σταδιακά βγαίνουν στο φως για να φτάσουν τελικά στην κορύφωση του φινάλε, κάνοντάς μας να συνειδητοποιήσουμε πως τίποτα δεν είναι όπως φαίνεται και πως αν δεν έχουμε τα μάτια και την καρδιά μας ανοιχτά, μπορούμε να χάσουμε τα πάντα. This was one of the most boring books that I've ever read. In this edition, there are 326 pages and it only starts to pick up in the last 40 pages. What really annoyed me about this book is that Tanya isn't the sharpest tool in the shed. Not only that but she's in the "terrible twelve" stage. I wanted to bang my head against the wall! If fairies punish you every time you try to reveal their existence (Tanya writes and buries her diaries in hope of them being discovered), you would stop doing it. I This was one of the most boring books that I've ever read. In this edition, there are 326 pages and it only starts to pick up in the last 40 pages. If fairies punish you every time you try to reveal their existence (Tanya writes and buries her diaries in hope of them being discovered), you would stop doing it. If like Tanya, you feel that the punishments are so bad that they make you cry, then you would accept it and move on. And yet Tanya still kept on poking the bear with a stick! You would also do a little thing called, I don't know, research! Tanya has observed the behaviour and traits of certain fairies but she doesn't look for information. Sure, she stumbles across a book but surely she would have known some of the information already if she had researched fairies? Tanya must have had access to a library, books, documentaries and the internet at one point. I'm sorry, but I'm not going to feel sympathy for someone like Tanya. I admit that there were a couple of good, suspenseful moments but it doesn't actually lead you anywhere. Fabian and Tanya talk and run around but they don't actually do anything until the last 40 pages. Which leads me to the villain. I can't tell you how disappointed I was! Basically, the bad guy is a Disney villain wannabe. I'm not joking. I think the motive should have been strengthened as it was rather light. Unfortunately, I bought the sequel in a charity shop just a few weeks ago. I really don't want to read it so I'll be donating it to charity. Have you ever wondered if there is another world that is right next to you with different creatures? Well in 13 Treasures by Michelle Harrison, it is about a girl Tanya and her friend Fabian. Tanya has moved to her grandmother’s house. Tanya has moved there because she has been getting in trouble because she has the second sight. Her mother doesn’t know that, so that what gets Tanya to move to her grandmother’s house. She has to live there temporarily. In the house Tanya’s so called friend Fabi Have you ever wondered if there is another world that is right next to you with different creatures? Well in 13 Treasures by Michelle Harrison, it is about a girl Tanya and her friend Fabian. Tanya has moved to her grandmother’s house. Tanya has moved there because she has been getting in trouble because she has the second sight. Her mother doesn’t know that, so that what gets Tanya to move to her grandmother’s house. She has to live there temporarily. In the house Tanya’s so called friend Fabian lives there with his father and grandfather. That is were their journey begins to find who Morwenna Bloom is. She is a missing girl from 50 years ago. They start finding these clues that appear everywhere. It all started when Tanya had found a flyer in the library of a missing girl. Everybody knew the story behind it when Tanya and Fabian mentioned it, but nobody wanted to tell. This is when Tanya and Fabian go and find out the truth themselves and when they even find it up close. This book really grabs me into the story. When you read more and more different doors open up. This book is an adventurous mystery. There are different feelings and actions that guide you throughout the book. I really like how the author described the book specifically. You can picture what is happening. What I disliked was the beginning of the book. When I first started reading it was boring and confusing to me. There wasn’t anything so special and interesting to me. I couldn’t understand what the author was trying to say, but when you give it a try you will be happy that you did. I recommend this book to everyone. I rate this book a 5 star. My frist problem with this book was the title. The story had nothing to do with 13 treasures. There was a bracelet with 13 treasures and a brief mention of story connected to the treasures but, the main plot was about the mystery of a girl who dissappeared and the lead character trying to discover what happened. A more accurate title would have been The Mystery of Morwenna Bloom. Anoter problem I had was it took a long time to get to the main problem which was what happened to Morwenna Bloom. The My frist problem with this book was the title. The story had nothing to do with 13 treasures. There was a bracelet with 13 treasures and a brief mention of story connected to the treasures but, the main plot was about the mystery of a girl who dissappeared and the lead character trying to discover what happened. A more accurate title would have been The Mystery of Morwenna Bloom. Anoter problem I had was it took a long time to get to the main problem which was what happened to Morwenna Bloom. The frist problem you are introduced to at the beginning is Tanya's problem with faries. The faries are tied to the Morwenna story but, that is not clear at first. Morwenna is not mention until page 41 and there is still some wondering to do before it is clear that the Morwenna is the main problem. The story was also lengthed by the old dynamc that no one is being honest with each other. A turism of life. Three hundred and forty eight pages though is a long time to keep everyone locked in with they own secrets. That is the main problem with the story. You really have to be careful if a story especially a children's story goes beyond 250 pages. Yes, Harry Potter managed to do that but, this is no Harry Potter. Let me just start off by saying that whatever I say won't do this book justice. So please just go read it yourself! In the spirit of Harry Potter, Michelle Harrison takes us on a wild ride full of mystery with her unlikely main character Tanya. See, Tanya has a bit of a uncommon condition. She can see fairies. Not cute Tinker Bell fairies but vengeful devious fairies. When the fairies play a trick on Tanya it's the last straw for Tanya's Mom. She sends her away to live with her grandmother. This Let me just start off by saying that whatever I say won't do this book justice. So please just go read it yourself! In the spirit of Harry Potter, Michelle Harrison takes us on a wild ride full of mystery with her unlikely main character Tanya. See, Tanya has a bit of a uncommon condition. She can see fairies. Not cute Tinker Bell fairies but vengeful devious fairies. When the fairies play a trick on Tanya it's the last straw for Tanya's Mom. She sends her away to live with her grandmother. This is a terrible turn of events in Tanya's world but when clues start popping up in a 50 year old mystery Tanya may just get some of her question answered. I had heard some really great things about this book so when the chance came to read it of course I took it. I was not disappointed! 13 Treasures is full of mystery. There was never a dull moment! When I wasn't reading this, I wanted to be reading this. All of the characters were very very well written! I loved Tanya. She was mature and confident when other 13 year olds would have run screaming. All the secondary characters were great too. I loved Fabian and his Dad. I Loved the fairies also! There are tons of books out there about girls who see fairies. This one was no different but somehow it stood out! I really loved it. It read like a movie. I actually see this being made into a movie in the near future. I had a lot of fun reading this and I plan on buying the sequel from Book Depository because there's no way I'm waiting until the American release date!! Pleasantly gothic semi-modern story of one girl's struggle to cope with the fairies around us that she sees but no one else does. Like in Wicked Lovely, the fairies in this series are very evil, creepy, and richly described. They've been bullying Tanya her whole life for no good reason. Yet Tanya has an affection for these creatures which I found very confusing and out of character. After one particularly bad night, Tanya is sent away to live with her grandmother for the summer and begins to unc Pleasantly gothic semi-modern story of one girl's struggle to cope with the fairies around us that she sees but no one else does. Like in Wicked Lovely, the fairies in this series are very evil, creepy, and richly described. They've been bullying Tanya her whole life for no good reason. Yet Tanya has an affection for these creatures which I found very confusing and out of character. After one particularly bad night, Tanya is sent away to live with her grandmother for the summer and begins to uncover a great mystery of the past that will explain her own special abilities as well as her grandmother's personality disorder and her friend's grandfather's madness. The setting is a little confusing, I'm not sure if it's meant to be entirely contemporary or not. The book has some Tom's Midnight Garden overtones. Tanya is TSTL on more than one occasion. To the point that, when Tanya asks the question of herself, "Why hadn't she seen it sooner?" I actually said, "Because you're an idiot?" That said, changeling mythology is introduced half way through the book and suddenly the story gets very exciting despite Tanya. Tanya is your typical girl, with one exception. She can see faeries; courtesy of: the second sight. But these aren’t your average “we’ll grant you your every wish with a smile” faeries, no, they are the opposite. Dark, malicious, repulsive creatures. And they’re determined to keep their sinister existence a secret; by making poor Tanya’s life, a living nightmare. At the beginning, we are given a group of faeries, who are cautioning Tanya, for writing about them in her diary, regardless of her bur Tanya is your typical girl, with one exception. She can see faeries; courtesy of: the second sight. But these aren’t your average “we’ll grant you your every wish with a smile” faeries, no, they are the opposite. Dark, malicious, repulsive creatures. And they’re determined to keep their sinister existence a secret; by making poor Tanya’s life, a living nightmare. At the beginning, we are given a group of faeries, who are cautioning Tanya, for writing about them in her diary, regardless of her burying it to erase her actions. They then punish her by causing chaos in her bedroom, which leaves Tanya’s tired mother no choice but to send Tanya, and her dog Oberon, off to live with her grandmother, Florence, at Elvesden Manor, for two weeks. But while Tanya is there, she is left to her fate, and after a series of events, she begins her quest to discover the truth about Morwenna Bloom, a girl who disappeared in Hangman’s Wood fifty years ago, and was, mysteriously, never found. Accompanying her in her research is a silver charm bracelet, given to her by Florence, and which she later finds out is based on the thirteen treasures and includes little (fake) replicas of each of the treasures. There is also a stained, brass compass, with a fascinating purpose, a silky red scarf, and an interfering, mischievous boy, mixed altogether with a cauldron of spine-tingling mysteries. I really enjoyed this book; it was captivating, intriguing, and simply magical. There is a definite mood that has been fashioned with skill. Ωραία περιπέτεια, γεμάτη μυστήρια και αινίγματα που είναι δύσκολο να μαντέψει κανείς τις απαντήσεις. Εκπληκτική, σκοτεινή ατμόσφαιρα και αρκετά μελαγχολικό ύφος που σπανίζει σε παιδικά- εφηβικά βιβλία. Το βρήκα απρόσμενα καλό. I was hoping for more. It was a convoluted story with contrived dialogue. That sounds harsh. But I can’t help it. I didn’t like it. And the main character needs a lesson in stranger danger. That was the point of this book? The fairies in this book were awful, violent and often gross. Even the “good” ones. So, t I was hoping for more. It was a convoluted story with contrived dialogue. That sounds harsh. But I can’t help it. I didn’t like it. And the main character needs a lesson in stranger danger. That was the point of this book? The fairies in this book were awful, violent and often gross. Even the “good” ones. So, take that Disney and your preconceived notions you’ve been shoving down our throats all these years. Kids: beware. This book wants you to know that Tinkerbell is not your friend. She will do her utmost to make your life miserable. I can understand the idea of challenging the norm. But many books have done it better. I consider myself incredibly lucky. This book wasn't even on my radar, despite some glowing reviews, when Simon & Schuster sent it through to me. Thanks to them, I've had my eyes opened to a truly thrilling world of the Sidhe courts and mysteries unsolved. This a beautifully dark little book. I often find myself sceptical about fairies - they seem so do-goody and Tinkerbell-esque, in the most part. In this case, however, Harrison has tapped into folklore and scary fairytales to present us with fairies that have bite. They steal children, commit mischief and cause mayhem on a whim. They are not friendly, or pretty - and I love them all the more for it. The fairy characters in this book truly leap from the pages. They are not alone in that respect. Harrison writes her human characters just as well - Tanya is resourceful and courageous; Fabian is geeky and intelligent; Red is punky and perfect (seriously want to be reading more about her in the next two books!) Their voices are distinct and they felt fully-fleshed. At first I found Harrison's prose fairly perfunctory, but it developed well over the course of the novel. This story takes place in the summer and, despite reading it in the cold of winter, I could almost feel the humid darkness of a stormy summer evening. It was beautifully done. This is a really timeless little book. It has echoes of Enid Blyton, what with the secret tunnels and the planning for adventures in a nearby woodland, and reminded me a little of the Carbonel series by Barbara Sleigh (another children's novel where the magic and mundane collide). I feel as though The 13 Treasures could be picked up and enjoyed by children in years to come, thanks to the ageless feel of the story. It could be argued that the adults in this novel were poorly presented, what with the secrets that they hid from Tanya, but I suspect they shall come into their own in future books - particularly Warwick. It would be incredibly nit-picky to suggest that this spoilt the story at all for me. 13 Treasures is a book about a young girl, discovering mysteries while at her grandmother's house. Tanya is a young girl with a rare ability to see fairies. These fairies aren't the kind, wish-granting fairies we imagine, they cause Tanya trouble, and annoy her. At her grandma's house Tanya runs into many fairies and mysteries. Elvesden Manor turns out to be the place where a young Morwenna Bloom disappeared aot knowing the real reasons behind her "antics" that are led by the fairies, Tanya's m 13 Treasures is a book about a young girl, discovering mysteries while at her grandmother's house. Tanya is a young girl with a rare ability to see fairies. These fairies aren't the kind, wish-granting fairies we imagine, they cause Tanya trouble, and annoy her. At her grandma's house Tanya runs into many fairies and mysteries. Elvesden Manor turns out to be the place where a young Morwenna Bloom disappeared aot knowing the real reasons behind her "antics" that are led by the fairies, Tanya's mom sends her to Elvesden Manor, her grandmother's house for a break. At hbout fifty years ago. It's up to Tanya, and her scientific friend Fabian to solve the mystery behind Morwenna Bloom. I would rate this book a five because I really liked the main character, Tanya. T times I could really relate to her. Like when Tanya feels like she can tell anyone about the fairies and how she can see them, it reminded me of the times when I couldn't tell certain things to certain people, and had secrets. I could also relate to her when she lost her dog, Oberon in the woods, which relates to me because of the time I remember when my friend told me my hamster had escaped from his cage, but was later found. This book's genre is fantasy. 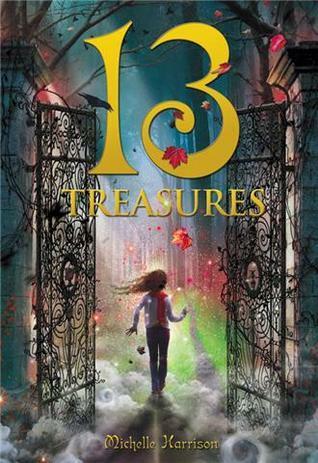 13 Treasures is also a great book because it has a great plot, and the author, Michelle Harrison does a great job writing each part. I liked how it was written like a puzzle piece. YOu had to think about everything to solve the problem. Like the fairies, and who Tanya really is. This book was about more than 200 pages long. I really enjoyed 13 Treasures, and it will be one of my favorite reads. I love the 13 Treasures trilogy!! Book 1 began the fun for me. 13 Treasures is about a girl named Tanya. But Tanya isn't any ordinary girl! She can see fairies!!! These fairies are not the typical sweet little pink and purple fairies most people automatically picture when they hear that word. Some are okay i guess. But some are evil. up to no good. Luckily, Tanya is not alone. She is forced to go live with her grandmother for what seems like the longest summer of her life! I really loved the des I love the 13 Treasures trilogy!! Book 1 began the fun for me. 13 Treasures is about a girl named Tanya. But Tanya isn't any ordinary girl! She can see fairies!!! These fairies are not the typical sweet little pink and purple fairies most people automatically picture when they hear that word. Some are okay i guess. But some are evil. up to no good. Luckily, Tanya is not alone. She is forced to go live with her grandmother for what seems like the longest summer of her life! I really loved the description of all the fairies found there! The fairies know Tanya can see them and they definitely don't give her an easy time because of it. On top of that, Tanya's grandmother Florence isn't so fond of Tanya living there. The only plus is the butlers son, Fabian. Fabian cannot see fairies but he becomes aware that they exist. Slowly they uncover the secret of the sudden disappearance of Morwenna Bloom, an event that took place years and years ago. This book is basically torture. Chapters ending with cliffhangers and topics being put to the side to make room for new ones! I absolutely love this book. I'm only 11 years old but this book made perfect sense but it wasn't exactly "dumbed down'. I would read this book 1 million times if I could!! This book was totally unexpected !! When I picked up the book at the library a few months back, all I wanted in a book was a descent fairy tale. After "Fablehaven" I so badly wanted another series that can make me feel like a little girl. This story has a total different understanding of "fairies", which was fascinating and frankly quite scary. The first few chapters made me want to rethink reading this book. But the idea was refreshing and the story itself was quite the mystery ! It has the haun This book was totally unexpected !! It has the haunting manor, a forest, an old grandmother, the housekeeper and a young girl with special abilities. It really can't get anymore cliche, but with a history not quite like others and a dark secret kept for centuries was very well played out through the book. And of course a heart warming ending that will beg your attention for the second book. A girl who can see fairies is persecuted by them for second sight. Fed up with her stranger behavior, her mother packs her off to grandmother's strange, old, rural house. Soon she stumbles upon other odd goings-on, including baby disappearances. ever since i was a tiny egg, i have been fascinated by fairies. i had fairy costumes, books, paintings, toys, you name it, i had it. even now, stories about fairies entertain me greatly. i read this book when i was about ten or eleven, and loved it. my copy of it is completely battered. it took me a while to get my teeth into it, but once i did, i couldn't stop obsessing over it. I liked the book because it was filled with mystery and that made me want to keep reading on. It made me keep wanting to read on because you never know for sure who the good person is and who the evil fairy is. Coming off of a couple of dud books, I was thrilled to be rereading The 13 Treasures. Middle grade fantasy is always right there for me when I need it. The 13 Treasures is super fun: faeries (good and bad), a mystery, an old manor house with secret passages, distinctive characters—it's got it all. I really don't have much to say about this novel, and certainly nothing bad. The plot chugs along at a nice pace, there's no moronic middle grade romance, and the fantastical elements are engaging. I'd Coming off of a couple of dud books, I was thrilled to be rereading The 13 Treasures. Middle grade fantasy is always right there for me when I need it. Great stuff; evil fairies, a witch, a ghost/traveller between world, secret passages, creepy woods and family secrets. Loved it. This is a wonderful book! I liked and enjoyed it so very much! The premise isn't something terribly original! It's about a girl that can see the fairies roaming the world all around us. It's been done many times before but this is the only one I actually liked. Harrison based her fairy realm on research she's done and it shows. She is incorporating the Seelie and Unseelie Court mythology, as well as ways to protect yourself against evil fairies that are rooted in folklore. Her fairies are distinc This is a wonderful book! I liked and enjoyed it so very much! Harrison based her fairy realm on research she's done and it shows. She is incorporating the Seelie and Unseelie Court mythology, as well as ways to protect yourself against evil fairies that are rooted in folklore. Her fairies are distinct personalities just like the characters. They are described beautifully, they are attributed unique gifts and habits and they can be really nasty and scary. In most off the books about fairies, they author (1) goes for the shock factor by sexing them up, like in Wicked Lovely, (2) comes up with something ridiculous and unbelievable as in Darkfever or (3) claims they are dangerous, evil and nasty but it's usually just talk; and then there's always the Disney version. In this book Harrison chooses to stay traditional with their appearance, she keeps them detached from the human world, but still interacting with it, and when they decide to turn nasty they really do mean business. Those forest scenes were schilling. I loved the characters as well. I liked the friendship between Fabian and Tanya. I liked that they were two independent personalities, that didn't necessarily get along, but since they were brought together by circumstances they decided to try and work out their differences in order to achieve a mutual goal, and through this ordeal a beautiful friendship was build. Fabian was geeky and quirky, he was smart and bullheaded. He was very much what you'd expect a 12 or 13 year old boy to be and he was intriguing, mysterious and enraging at times. Tanya was amazing! She was kind, patient and understating to the adults, than never believed her and insisting on punishing her, and to the faeries for they weren't all out to torment her. She was brave, compassionate, unbiased and just. She loved puzzles and she was a great friend! She was also naive and uncertain, she was getting mad at people and even threw the occasional tantrum but firstly she was entitled to one and secondly it only made her character more realistic and that's what I adored about Tanya. The whole plot of the book wouldn't exist if Tanya wasn't in possession of a unique ability but, and this is a big but, she is not the typical special snowflake that everyone treats as if she is the beginning and end of everything. Tanya is presented as a normal 12 year old girl that is sent to the grandmother as a punishment for being difficult that just so happens to be able to see faeries. The plot was quite predictable but I din't mind one bit because I loved watching it unfold. I'm not a fun of third person omniscient, I'd much prefer the third person limited point of view, and Harrison needs to work on how to handle dramatic plot deliveries as well as drooping clues inconspicuously throughout the book, but overall I enjoyed her writing. I though the adults' book time was suspiciously little. Tanya was sent to her grandmother as a punishment but there were no chores, no lecturing, no nothing. She was felt to her own devices and allowed to roam freely which, given the circumstances, didn't make much sense. I recommencement this book to people that like mysteries, dark and scary faerie tales, interesting characters, and don't necessarily require romance. I've also written UNREST, a ghost story for young adult readers. My most recent novel is THE OTHER ALICE, which won the Calderdale Book of the Year Award 2016. My My first children's novel, THE 13 TREASURES, won the Waterstone's Children's Book Prize and has been sold for translation in 17 countries worldwide. It's followed by two sequels: THE 13 CURSES and THE 13 SECRETS, and a prequel, ONE WISH.